Boarding a new Boeing 737-800 Hainan Airlines aircraft at Tolmachevo Airport. The S7 is the largest domestic carrier based at Tolmachevo International Airport. The new renovation of the domestic terminal at Tolmachevo International. The modernisation of the domestic terminal extension block has allowed a great improvement in the level of passenger comfort and services. The first floor of Tolmachevo's new passenger terminal has a great number of new facilities for passengers. 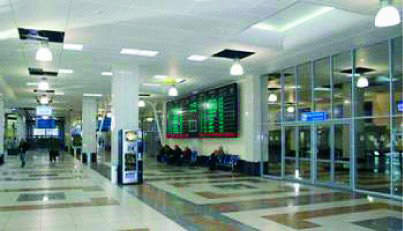 The refurbishment has lent a bright new airy feel to the terminal and provided comfortable seating in the gate areas. Novosibirsk Tolmachevo Airport is situated in Ob town about 16km from the centre of Novosibirsk, an industrial and scientific centre in Siberia which is Russia’s third largest city. The airport first opened in 1957 (Tolmachevo Airport was 50 years old in July 2007 and held celebratory events to mark the occasion) and is operated as a joint stock company with 51% being owned by the state. The airport also has two passenger terminals (domestic and international), one cargo terminal and 61 aircraft stands. 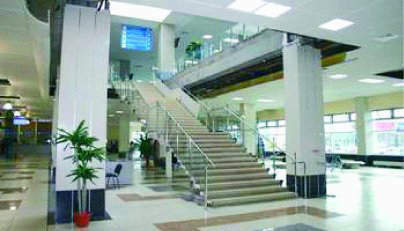 The international terminal was fully renovated in 1997 and the airport was able to receive ISO 9002-96 certification. Tolmachevo is currently hosting around 20,000 aircraft movements each year and handled 1.66 million passengers in 2006. In February 2007 the new general plan of Tolmachevo International Airport, formulated by Obermeyer Consult Ltd and Center Consult Ltd, was presented to the board of directors and was approved (federal authorities now need to approve the plan). The project includes the reconstruction of runway, taxiways, airport infrastructure and existing passenger terminal, construction of new passenger (40,000m², with a capacity of 2,500 passengers an hour) and cargo terminals (10,000m² and 20,000m²), a three-star and four-star hotel (600 beds) and a car park for 700 cars. New airport infrastructure will include a 60,000m² logistical centre, a catering department able to produce 6,000 meals a day, an expo- and congress-centre of 34,000m² and 50,000m² respectively and a multifunctional retail and entertainment centre with a floor area of 50,000m², including hypermarket, trade gallery, movie theatre with 200 seats, several restaurants, a food-court and a bowling complex. The total investment for this project will be R15,720.5m ($280m). Of this R12,031.5m will be invested from the airport and investors funds, R612m from the regional budget and R3,077m from the federal budget. The construction of the second runway will be finished in 2008. This will greatly increase the airport’s potential; it will have the ability to handle an additional 5.5 million passengers a year. The airport will then be certified under category II of ICAO and the flight intensity will more than double (more than 37 aircraft movements an hour), and the flight safety will be improved allowing aircraft to approach the airport without flying over the city. The first stage of the project including the new cargo terminal will be handed over at the end of 2007. The second runway will be completed by 2008. The new passenger terminal for domestic and international flights, the four-star hotel with 600 rooms and the new car park are planned to be built and equipped for the end of 2009. The project also includes a highway connecting the new and existing terminals, which will be ready in 2009. The third stage of the investment programme is to be finished in 2012. This will include the congress centre (50,000m²), the logistics centre (60,000m²) and the entertainment complex. The expansion work is expected to satisfy the needs of the airport for the next 20 to 25 years. Tolmachevo will become the largest aviation hub beyond the Urals providing a vital link between Asia and Europe. 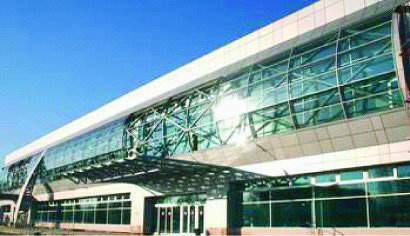 Toward the end of 2006 the wide-ranging domestic terminal complex renovation was being continued. The official opening of the first floor was in September 2006. The new extension block has shops, cafes, taxi ranks, hotel booking facilities, car rentals, entertainment complex, medical services, mother and baby room and Wi-Fi access points. The modernisation of the domestic terminal extension block has allowed a great improvement in the level of passenger comfort and services. 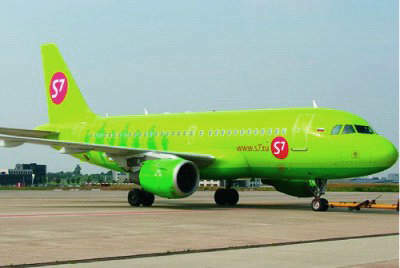 The main domestic airline at the airport is S7 which uses the Airbus 319. The terminal extension, has allowed an increase in capacity from 1,000 to 1,800 passengers an hour. Since May 2006 passengers and visitors of Tolmachevo Airport have been able to take advantage of a new service – wireless broadband access to the internet with the help of Wi-Fi technology. Wi-Fi ‘hot zones’ are located in the domestic flights terminal on the first floor in the VIP hall and a waiting room (the right wing), and also in a waiting room and business hall on the second floor. In order to take advantage of this service, it is necessary to have a laptop equipped with a Wi-Fi 802.11b standard card. Wi-Fi access is via a card, which can be obtained at all airport cafes, which have an orange Wi-Fi sign. The Wi-Fi access card costs R120 for an hour of access time (cards are valid for one week). The construction of a new cargo terminal complex, which meets modern logistic requirements, was started in 2006. The first stage of the cargo complex will be put into operation in 2007. The cargo operator responsible for the service is the Tolmachevo Terminal Service Company. In 2006 a major modernisation programme of the ground handling equipment at Tolmachevo Airport was undertaken. Much of the cargo and baggage handling equipment was renewed with more modern plant including platform container loaders (Commander – 15i and CLT-8) provided by FMC. The equipment is designed to work with cargo, transported with the help of packaging facilities (containers and pallets) and allows a reduction in the time needed for the aircraft handling. The cargo operation at the airport also uses the self-propelled automatic loader PLC 70/73 WP by Trepel of Germany. 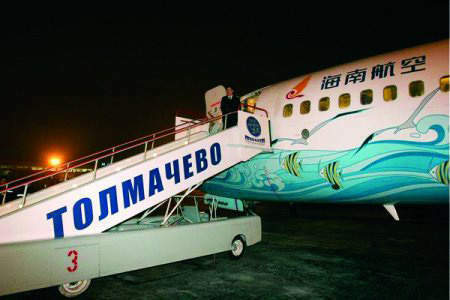 The baggage handling company at the airport is the Siberian Aviation Complex and they have also recently introduced a Russian-manufactured band conveyor to assist in the unloading of passenger baggage. 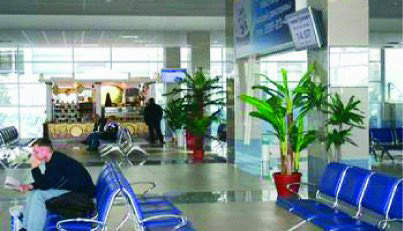 In 2006 Tolmachevo Airport improved its methods of providing security control. This was done through the introduction of a new profiling system (developed by Ben Gurion International Airport in Israel) to airport staff by Van Damme International Security Management BV of Moscow. More than 28 employees at the airport including four psychologists were taught the new method of detecting potentially dangerous passengers and situations in the different stages of security control. The Tolmachevo Airport psychologists, who form part of the Aviation Security Service, had previously studied the new profiling system in Moscow and already implemented it at the airport. The system consists of a unique computer programme to create and archive the data about potentially dangerous passengers. The programme allows the airport staff to anticipate situations and undertake security measures when suspect passengers board the aircraft. Tolmachevo Airport is one of the few Russian airports where the system of preliminary passenger psychological testing is being implemented. The work of psychologists consists of processing the data obtained during the ticket sale, observing the departure passengers or observing people with suspicious behaviour and finding out the reasons that make the person appear nervous.